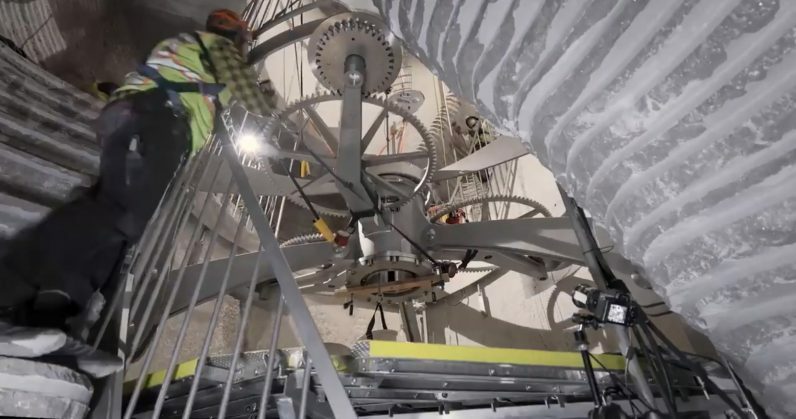 Amazon founder Jeff Bezos took to Twitter to announce that construction of the 10,000 year clock has begun on his property in Texas, with a view to encourage thinking about humanity in the long term. Conceived back in 1986 by American computer scientist Daniel Hills, the clock’s mechanism is designed to advance far more slowly than your average timekeeping device: it’ll tick once a year, its century hand will move once every 100 years, and its cuckoo will emerge every millenium. The project was fleshed out at the Long Now Foundation, a San Francisco-based nonprofit that aims to foster thinking in longer terms than months and years about our time on earth, and our responsibilities towards society and the planet. Following the completion of a few prototypes, the Foundation has now begun building a 500-foot mechanical version on Bezos’ land in the Sierra Diablo range of West Texas. The construction is presently drilling into the mountains there to house its components, which are being machined and assembled in California. There’s no schedule for completion of the project, but you can expect it to take a while. Once it’s ready, you should be able to visit and see it with your own eyes. Ideally, it would do for thinking about time what the photographs of Earth from space have done for thinking about the environment. Such icons reframe the way people think. It’s an interesting time for this project to break ground, given the rapid pace of advancements in technology and the global scaling of major corporations in the past few years. It seems only natural now, that this clock is being installed on property owned by the richest man on the planet.